Saltesmo - Detection of salt in food and sea water Saltesmo test discs are frequently used for the determination of salt (NaCl) in foodstuffs and in sea water. Saltesmo is also used for the detection of salt water in ships. 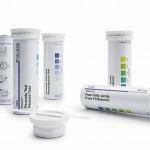 All reagents are impregnated on the paper, making the test very easy to use, even for untrained personnel. Simply pierce a hole in the disc using the needle supplied with the test and allow the disc to soak in the sample for 2 minutes. A discoloured zone appears around the hole and the size is proportional to the chloride concentration in the solution. Quantity discounts available. Contact us for details.